Shake. Shimmer. Dry. Go. 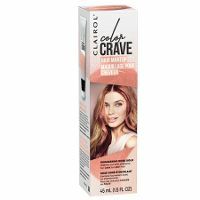 Clairol Color Crave temporary hair makeup puts a little luxe in your locks. Shimmering hair makeup instantly adds 1-day wow that’s visible on any hair color, even the darkest brunettes. Change your mind or your mood? Hair makeup washes away with shampoo. With no ammonia, no peroxide, no parabens, and no commitment, there’s no reason not to flaunt your fearless.